Direct Response Copywriting: Will this help you catch fish? This is a perfect example of going for third base on your first date. If you don't have anything else to say, click on like, or share. Your name will show up doing so. Do this regularly and you can slowly start making short comments every now and then. When you find the opportunity to make comments, offer something of value. For me, the best time to chime in is when someone asks for help. If you have the solution, offer it to them. 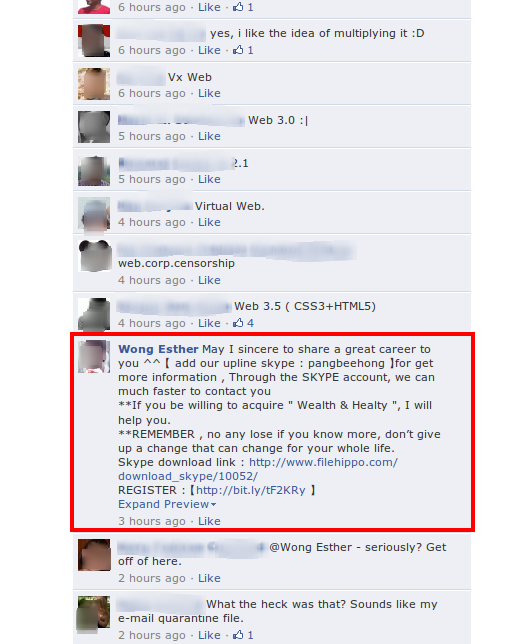 Do this often and the page owner will reciprocate by visiting your facebook page. These spammers know that their market are predominantly english speakers, why not learn how to write better english? One hour a day of writing for the next thirty days will help. 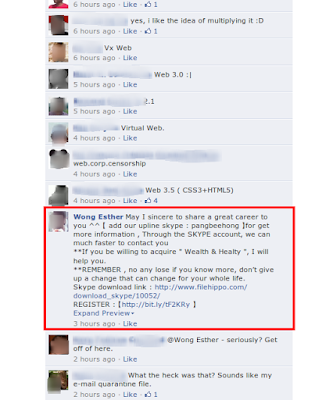 Better yet, if you are a non-english native and want to spam on facebook, spend some time crafting your message offline. Polish it. Perfect the grammar as much as you can. Spamming does not work, but at least people will get your message. This way, when enough readers were to see your message, you just might get lucky and get a sale. One half of one percent, multiply that by two hundred readers and you have one sale. If you are going to market your brand as status updates (spam commenting), you still have to structure your message as a sales letter--get attention, offer value, ask for action. I will tell you more about this in the coming days.